One of the great stories to emerge from the world of blues and vintage soul music is the rediscovery and career renaissance of the great Willie Walker. After decades of being pushed to the side of the music world, Rick Estrin found Walker on a blues cruise of all places. Walker was a paying customer who was being dissed by the pro jammers who didn’t know who he was. How perfect is that? Estrin recognized Walker of course and got him into Chris “Kid” Andersen’s Greaseland Studios. In 2015, they released an absolute masterpiece that was put out on Jim Pugh’s Little Village Foundation label, If Nothing Ever Changes. In 2016, they followed that up with a CD which featured Walker fronting Andersen’s Greaseland All-Stars on a live set, entitled Live! Notodden Blues Festival which was recorded at that great annual event in Norway. By this time Walker had begun traveling the festival circuit with guitarist Anthony Paule and his band, where they remain a big hit. These dates included featured performances at the prestigious Porretta Soul Festival in Italy. After honing their chops on stages all over the world, Wee Willie Walker and The Anthony Paule Soul Orchestra went into the Fantasy Studios in Berkeley, California, and made this wonderful CD. These thirteen tracks feature Walker whol, after all these years, is still at the top of his game. His performances here leave no doubt that he is as a soul singer who is now in a class by himself. As for guitarist Anthony Paule, he sounds like he has found the perfect vehicle for his talents. He, along with his partner in life and music, Christine Vitale, demonstrate here that they are a formidable songwriting team. Selected covers include the Eddie Curtis classic Lovey Dovey from the Atlantic Records vaults and the Issac Hayes/Dave Porter penned Your Good Thing (Is About To End) among others. As far as the Anthony Paule Soul Orchestra is concerned, they are an eight piece “little, big band” which includes a four-piece horn section and the wonderful keyboard work of Tony Lufrano who employs a Steinway Grand Piano, a Wurlitzer or a B3 depending on the song. The use of three backup singers fills out the soundscape to an even greater degree, helping to create a lush bed of music where Walker can really stretch out and share with us the humanity that lives in his voice. After A While is proof that deep, vintage soul music can, in the right hands, sound fresh and exciting. Whoever said that there are no second acts in life hasn’t heard of the continuing saga of the great Willie Walker. That saga continues in a big way here on this CD. 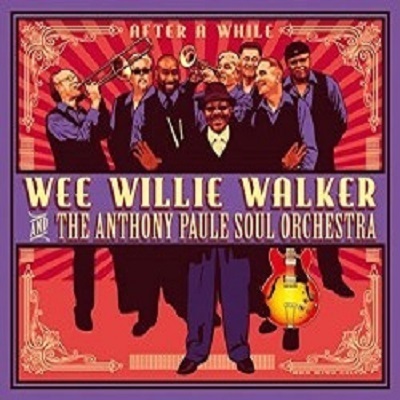 After A While by Wee Willie Walker and The Anthony Paule Soul Orchestra gives us that much needed soul massage that makes life worth living. Our ezine is a labor of love. We appreciate donations, which help support our efforts.